Heat oven to 350°F. Spray cookie sheet with Crisco® Original No-Stick Cooking Spray. Carefully cut loaf lengthwise and then cut each piece in half crosswise to get 4 equal pieces. Press each piece of dough into square on cookie sheet. Sprinkle dough squares with basil and rosemary. 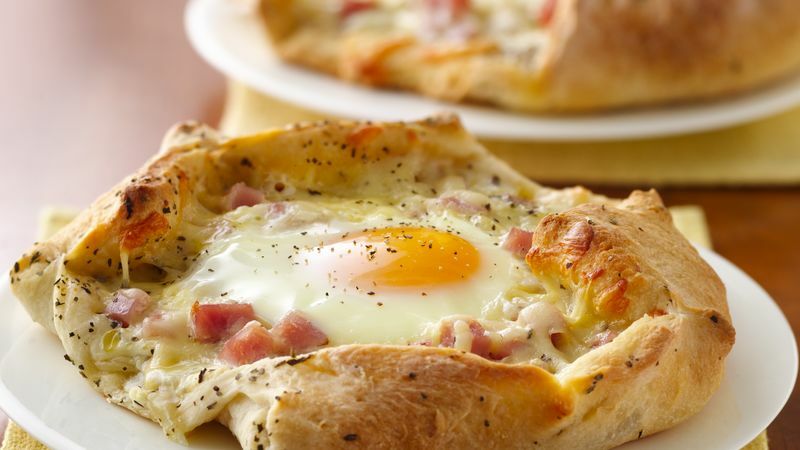 Top dough squares evenly with ham and cheese. Make small well in center of ham and cheese on each square. To form crostatas, fold edges of dough up 1 inch over filling, making pleats and pressing dough firmly. Carefully crack open each egg and drop into well in each crostata. Sprinkle with salt and pepper. Bake 20 to 25 minutes or until bottoms of crostatas are golden brown and egg whites and yolks are firm, not runny. Diced cooked breakfast sausage or crumbled cooked bacon can be substituted for the ham.